Daily Drama 77 – Get Out! Yes, in fact Princess Blur is still living in my bathroom. She gets two different heart meds, three times a day, so it’s nice to have her conveniently located. At night we can hear the wheezing that is a symptom of her heart murmur. She hops up to her roost with ease, but has never in five months hopped out of the bathtub. The loose feathers redistribute when she flaps and I noticed recently that The Bartender has moved his toothbrush into another bathroom. She is well into her slumber when I go in to brush my teeth in the dark. I don’t want to disturb herby flipping on the lights. Princess Blur evaluates the clean blanket prior to strategizing its fall from grace. When I first brought her in, I toyed with the idea of making some chicken diapers, but I wasn’t that optimistic about her diagnosis. She hangs out with me as I work at my desk, but I am getting tired of washing unspeakably soiled fleece blankets. I guess diapers are my next project. The latest hurdle was beak trimming. When you spend your days on fleece blankets instead of dirt, your beak will grow long and interfere with your bite so that it’s hard to take your meds. Trimming her beak was even less fun than it sounds, so the goal is not to ever have to do that again. Online, I learned that the common solution was to give her a brick. The Princess was almost as insulted by that brick as she was for the beak trimming itself! I took a walk around the house looking for a suitable brick substitute. If you have seen my house, it will come as no surprise to you that the perfect object was sitting on the same shelf where I put it in 2008 after I bought it in Mexico City. 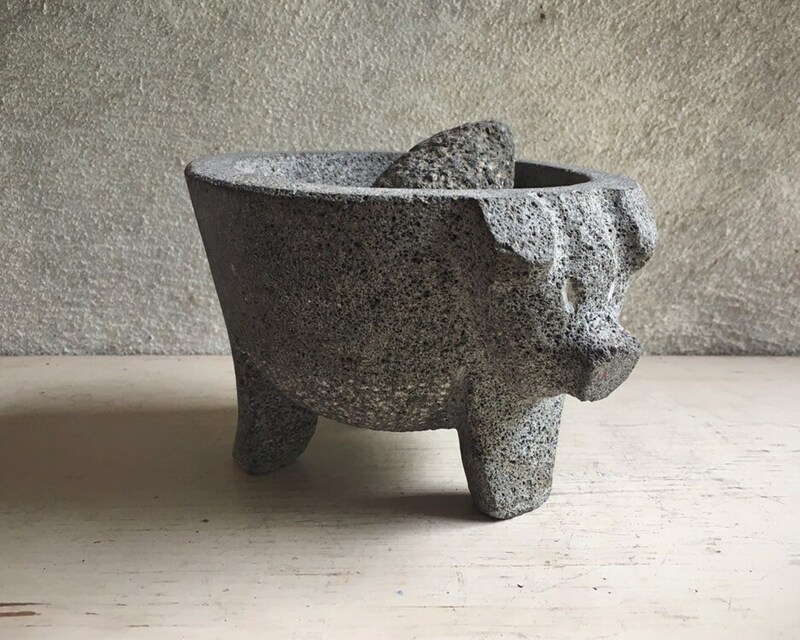 My pig-faced metate makes a perfect seed dish for Princess, and with any luck it will wear down her beak as she digs through for the sunflower seeds. Samantha, looking perky at the prospect of an afternoon out of the infirmary. And yes, Samantha, my Little Dead Hen, is still out in the infirmary, getting meds once every five days. An impossible regimen but it’s on my calendar and I usually remember. The lymphoma is ever-so-slowly taking her down, and she is painfully thin. She wants to be out with the flock, but she is so frail she falls over at the slightest breeze. And then can’t get up. In the infirmary, her food and water is efficiently located, she has a heated pad, and she can see and hear everyone, day and night. She cries for me in the morning when I deliver her breakfast: a little dish of rice, pancakes, or her new favorite: corn muffins. She also gets yogurt, cottage cheese, scrambled or hard boiled egg sprinkled with probiotic powder. Topped off with frozen corn or peas, maybe some fruit. She eats less and less of it, to the delight of my hen Angel, who hops up for first dibs on yesterday’s leftovers. Still, Samantha looks forward to her breakfast every morning, and digs right in. Samantha and Princess enjoy an afternoon snack together. 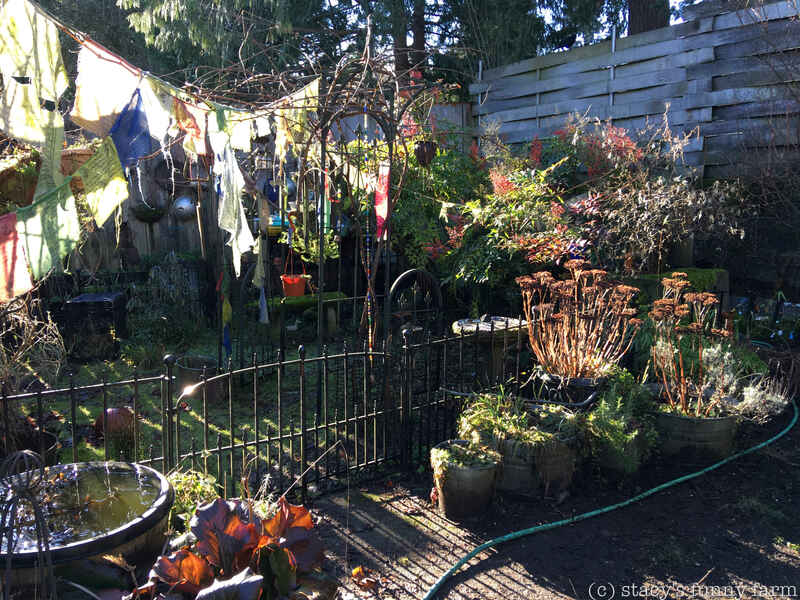 Suddenly, our late-season snow melted, the ice thawed, and the sun came out. When the flock invades the back yard for the afternoon Garden Party, Samantha takes over a small corner of Dobby’s old pen. She has a heat lamp, food and water, and nobody can bump into her. When it warms up nicely, I even bring out Princess. They are both lonely but essentially bedridden and they have fun chatting and sitting in their rocking chairs together. We’re still going to have wet and chilly spring weather, and I will have to decide every day whether it is worth the risk to put them out. I will be rearranging the furniture out there so they have access to a larger covered area, and I can add another heat lamp if they use it. Coffee Bean, Windy, and Angel are shocked to discover that Princess has magically reappeared. They hadn’t seen her for months. I also have a little dove who commutes. It seems like every winter there is one who has a tough time and ends up on the ground. They came in as an established flock in 2008, so none are younger than eleven years old, and most are much older. Anyway, this little bird went into a heated cage in the barn before the snow, but she still isn’t flying much. Putting her straight back out with the flock was not successful, so I have fixed up a transitional cage out there for her. She first spent days there, returning to the barn at night. When it warmed up, she spent the nights in the outside cage. Finally, I have started letting her out during the day, and the flock is more accepting, though she still can’t fly very high. She’s trying harder now, so even though I am still caging her at night, I think she’ll soon be flying back up to the high perches. Doves in a cage looking at a dove in a cage. So now I have two hens going out to the backyard every afternoon, and a dove commuting between her flock and a night cage every day. Who else has cabin fever? How about Fat Bonnie? She used to join the Garden Party every afternoon. After she picked up three botfly larvae that had to be $urgically removed, I swore she would never see the outdoors again. That was several years ago, when the rat situation had reached epic proportions. The risk is much smaller now. So out she goes. Fat Bonnie, eating again, of course. The Graveyard used to be her favorite place in the yard, and now it is conveniently fenced. This means that when it is time to take her indoors, I need only chase her around The Graveyard instead of the entire yard and aviary. Lucky me. At dusk, send your thoughts and prayers to me as I herd the flock back into the aviary (and flush out the freeloading wild mallards), carry Samantha back to the infirmary, return the dove to her night cage, lift old Coffee Bean up to her favorite roost (Didn’t I mention that spoiled hen earlier? ), bring Princess indoors, take a breath, and chase Bonnie until she allows me to lift her up and toss transfer her back into the kitchen. Then Princess gets her meds, and I am grateful to have a bartender on staff. This invasion took place during a Garden Party, long ago. This is the rabbit palace, but they are out in the yard. A couple of hens and a marauding capybara have taken up residence. I am tempted to proclaim April as Veterinary Care Month. Last year we had the disastrous fractured incisor incident, and I’m not at all certain that Dobby didn’t fracture his vertebrae at the same time. It took me quite a while to recognize his stumbling swagger as a constant, increasingly frequent miss-steps. We have had him on pain meds, calcium supplements, and UV lamps since December (six months) with no perceptible improvement. In fact, his stumbling is even more pronounced, and he walks like his old Farm Manager, with her sciatica. With that information and consulting with three veterinarians, he has been on gabapentin for a week. Yesterday, I upped his dose, and this morning his swagger is more controlled, back legs not buckling so often. He has good days and bad, so it will be a while before we have his dosage adjusted properly. I am a professional Landscape Architect. Deck repairs are delayed until I am certain we don’t need ramps. Killers during freezing weather, ramps are slick as snot when it rains, too, so they aren’t a great idea in this climate. Meanwhile, an attractive assortment of anti-skid devices still decorate the deck surfaces with the most traffic. They are incredibly effective and I am thinking of submitting this theme to Sunset Magazine for their consideration. I had also lowered Dobby’s bed but the chambermaid has complained that the new surface is extremely uncomfortable on her knees as she crawls in daily to straighten the blankets. Out of deference to her advanced age, I ordered a thin memory foam mattress topper. The bed is still very low, but she is no longer complaining, and Dobby probably likes it, too. Dobby and I both have funny hats. In other veterinary news, the newer of my two muscovy hens, Beverly, took a beating at the Spring Mating Festival. The vet removed a hardened mass from the site of the damage, and with 6 stitches on her head, she has been unhappily detained up in the infirmary. From there, it’s easier to grab her twice daily in order to toss the penicillin tablets down her throat, and the stitches have had time to heal in a somewhat clean environment. She’s out of there, now, but the drakes are relentless, so she has been spending her days in the back yard with Princess Blur. Without whom, no Daily Drama is complete. Blur still prefers to be carried everywhere. It keeps her foot feathers clean. While Princess and Dobby are grazing (Blur’s the only hen with Front Yard privileges), I’ll tell you about Snow White the dove, and the rest. Snowy’s still not flying, so she’s back on antibiotics. Spitfire the Budgie is through with her round. I found Stevie Ray the Guinea pig in distress about six weeks ago, and again late Wednesday night. He was fine the next day, but no younger. At 6-1/2 years, every veterinary visit is approached with caution. At the risk of the inevitable “Yes, he’s old!” diagnosis I took him in for an exam. We’re treating him for invisible mites, just in case, and his buddy Squirrel also gets treated. However, Stevie Ray has some sort of abdominal mass, a tumor, and that explains the weight loss and general malaise, so it’s a good time to pamper him. I had sequestered him at one end of their cage, and now that I have partially opened it again, both pigs have moved into his tiny apartment and are enjoying the new setup. Seriously, they are both holed up in that little area every time I peek in at them. Maybe I should decorate it with palm trees and gold draperies. Harness malfunction: that strap is supposed to be between his legs, under his chest. Dobby has trouble on stairs, so to discourage him, I have been setting out buckets at the bottom tread. That means that when I forget to place the buckets, he interprets that as a signal to immediately go up. Oy vey. It’s painful to watch him come down, but he’s very slow and deliberate. In spite of that, his left heel has a little booboo from hitting the riser on the way down. He tends to scuff the top of his back feet, on the knuckles, on the way up. The wild mallard ducklings are having a tough time this year. I see ten, then two, then one, then a lone mama, all in the space of a couple days. I have watched two hens have their broods decimated like that. Last year there were dozens, including the half dozen who sat outside this very door with their mama until I finally let them walk through the house to the back yard. Who needs to travel to Memphis to see the Peabody Hotel parade? The cats are still miffed that the newest hens prefer their favorite spot at night, instead of roosting like authentic chickens. I optimistically set up a similar space for the hens, but the cats moved in. Whatever. They are barely earning their keep. I had one rat tunnel under the fence until it found a rusty hole in the security flooring in the dove cage. I noticed the activity in time and wired on a hardware cloth patch. I now have a greater appreciation for vets who have to suture up a live being from the outside. It’s not as easy as sewing, where you can generally approach from both sides. Then there was the cute baby rat, a fancy black variety our neighborhood is famous for, found asleep on Dobby’s little Harry Potter bed (it’s under the stairs). Oops, not asleep, but not quite dead. I left Little Black Rat in a bucket overnight, under a bench, to expire in peace, but mostly so it wouldn’t crawl under the deck to become a week-long stink-bomb. He was quite dead in his bucket morgue this morning, but disappeared while I did a few more chores. That means a crow managed to spot Little Black Rat Corpse, get it out, and it’s half eaten “up there” somewhere, waiting to drop down onto something . . . or someone. That’s better than stepping on a full-grown one, though. Years ago, I stepped onto a LIVE rat, at the bottom of the stairs, right next to Dobby’s Harry Potter bed. It was a big one, running by at dusk, and his timing was not good. I stepped right onto him, and, as you yourself would probably do, I shrieked and jumped back. Unfortunately, I didn’t step on him very hard, so he jogged, and when I returned to earth, I landed right on top of him again, this time with gusto. I knew from the sound and sensation beneath my boot that he was a goner. I went directly indoors, not looking back. I don’t remember if I threw out the boots, but I sure don’t recall cleaning them. I’m pretty fearless, but I asked The Bartender to wait a couple hours “to be sure” and then remove it. Please. He’s such a good sport. Fat Bonnie still takes over Dobby’s area each evening. She isn’t usually this relaxed, but maybe after three years, she is finally feeling secure indoors. She is the most timid rabbit I’ve ever had. Timid or maybe just dumb. She is capable of a couple tricks, though, and turns a circle for a dried blueberry. She stands up for a rabbit cookie, too. She almost allows me to pet her. At least she’s relatively well behaved, though I prefer a dynamic but naughty pet to a shy one that snubs me. And that’s generally what we have here at the Funny Farm. Bad animals. Hoping for a summer 2017 launch! When I’m not sewing up holes in Dobby’s blankets at midnight, I have been writing. Sonya and I have been producing all sorts of goodies that might indicate that we are nearing the finish line. It won’t be long, now! There will be more than one blog topic generated this week, but I will be lucky if I manage to write up even one. First, this is the worst trip to Florida I’ve ever taken, but the Seattle weather here at home is cooperating and we’re going to try a couple local Cuban restaurants this week and pretend we are in Hollywood Beach. My mint has enough tender new foliage for mojitos, we have stocked up on rum, and The Bartender is doing his best to take our minds off the unexpectedly aborted vacation. This is the stay-cation, classic version, and it is nice to have a week off my grueling 8.75 hour a week work schedule. My little turtle, Quasimodo, emerged early in spring to say goodbye, I guess. He was never quite right, as you can tell from his name, but we had six nice years together. Doctor Pepper inherits his portion of the tank, and I hope he overcomes his extreme shyness the way Quasi eventually did. They rarely played “Turtle Pile” so I don’t think Doc had enough emotional attachment to feel grief, but animals are unpredictable that way. Lula the hen still receives her daily pain meds, but has had a couple setbacks in spite of it. She has walked stiff-legged for about a year, but recently added a stanky leg flourish to her amble. On sunny days, I bring her out to the yard to keep Dobby company. It also prevents my crazier hens from pecking at her. The bully pen has only three drakes this year, but one more has been “asking for it.” Romeo, Shamrock, and Emilio beg to attend the Garden Party every afternoon, but they are tricksters and I refuse to fall for their “Poor Me!” act. Tony, Vinny, and Sal have managed to retain their territory and it is refreshing to see them work together as a team. The twins Boondock and Boxcar are an even match to the trio, but one of them is a meany. Or maybe they both are, taking turns with sneak attacks. Because they work independently, Norman the Flock Manager is usually able to settle the disputes. The big news is very rabbity. Honey Bunny, my foster, has been surrendered to me. I just scheduled her to be spayed next week and then she will be available for adoption. It’s breaking my heart because she has been here since December and she is the best pet rabbit I have ever had, except maybe for Wiley. But he was a garden rabbit. Honey has taken over the house guinea pig room. Sadly, she is much more fun than my own rabbit, Fat Bonnie. Fat Bonnie doesn’t move. She sits, hunkered down in unjustified fear. A gorgeous mini-rex, “black otter” in color, she is the softest rabbit I have ever had. Too bad she hates to be touched. She doesn’t tolerate much attention of any kind, come to think of it. She loved Wiley Wabbit so much that in a jealous rage she tried to kill her sister, Helen. Fat Bonnie bit her and drove her far under the deck where I found her two days later, scared, hungry, and dehydrated. So I don’t trust Fat Bonnie with other female rabbits and she has never met Honey. They are aware of each other, but live in different areas of the house. Run, Fat Bonnie, run away! Quick, get under the shelves! Every night, The Bartender cleans and sets up Dobby’s kitchen area for her, and Fat Bonnie’s door is opened so she can scamper and run and explore and browse and interact with us. And every night we encourage and beckon and cajole and beg her to leave her pen and find the salad waiting for her around the corner. And every night (for eight months now) we end up pushing and nudging and shooing and sometimes I even just carry her around that corner to her evening play area. And there she sits all night until it is time to go back to her pen. She’ll emerge for a treat tossed her way, but mostly she’ll retreat behind the door at a sudden noise or activity in the kitchen. Like someone opening the refrigerator door. Is she the only pet on earth who is scared of that sound? The guinea pigs are down the hall wheeking, and Fat Bonnie is quivering under the shelves. Honey is probably a Hotot. I can’t really keep both rabbits. If they could live together or even if they would play together nicely, I would keep them both. I would prefer to find a new home for finicky Fat Bonnie, but it would be a hard sell. So I will be re-homing Honey Bunny, the better bunny. She hops readily into her cage at bedtime, but is perfectly well behaved out of it during the day. Well, except for the time she hopped up to the bookcase and broke a lamp. Or maybe that time she got behind the bunny barrier and ate her way through the guinea pig hay bags. Or when she opened the bag of shavings and decorated the room, or chewed a wire, or pulled a stack of towels through the bunny barrier. Or when she sticks her head through the gate to the hall and chews the edge of the hall runner. She has made a couple nests. She has an active litter box in her cage, and another in the corner of her room that she doesn’t use. Twice she has pulled fur and made a nest in the clean corner box. A few days ago, I saw her pulling fur again and looked in the box. She had dragged a blanket in there and two little stuffed animals- the monkey and the hamster! Her babies. She knew that it would be wrong to include the stuffed banana toy. So, little Honey is available. Let me know if you are interested!